Life is busy for everyone right? And it is only going to get more busy this time of year. I am trying to bring you delicious meals that are ready in 30 minutes or less. This is one of those meals. An easy and delicious 30 minutes meal that is packed with flavor and topped with cheese. In a large saute pan, add 1 tablespoon olive oil and turn to medium high heat. Sprinkle chicken with salt and pepper and add chicken to pan and cook about 10 minutes on each side until no longer pink and cooked through. Meanwhile, add 1 tablespoon olive oil to a medium saute pan. Cook garlic until tender. Add halved cherry tomatoes and cook for 1-2 minutes until they start to wrinkle and skin softens. Add chopped basil. 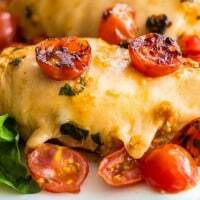 Top cooked chicken with mozzarella cheese and tomato mixture. Allow cheese to melt and splash with balsamic vinegar. I think this recipe is calling my name! 🙂 Looks wonderful. I love how easy, cheesy and hearty this is! My boyfriend will love this! This looks really yummy! I’m obsessed with all things “caprese” lately! I ALWAYS need easy recipes like this!! THANK YOU for sharing this recipe!!! I tried it tonight and it was DEEEEEEE – LISH – OUS !!!!! All the flavors were so fresh and married perfectly. It was as beautiful as it was tasty! And it was so simple to make! My husband LOVED it … we will definitely be making this again … and again … and again!!! 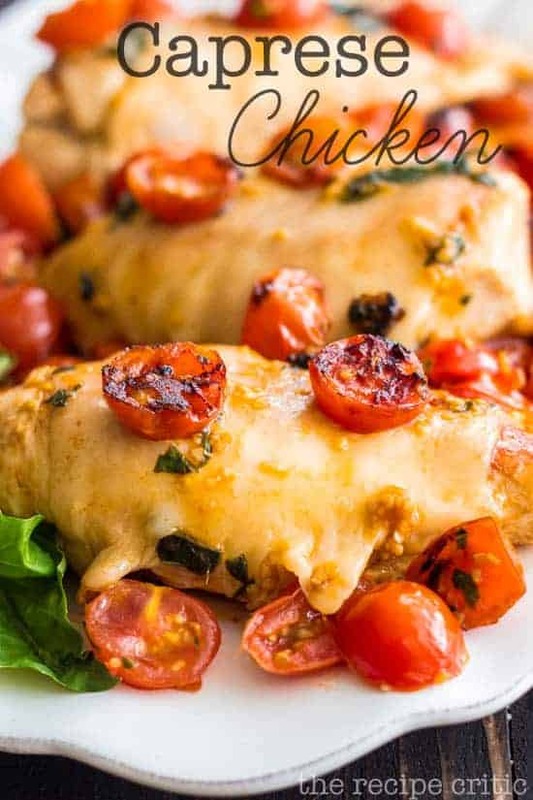 This recipe was simple and delicious!Grilled Chicken Caprese The chicken breast gets seasoned with Italian seasonings, garlic powder and onion the chicken then top each breast with a slice of mozzarella cheese, tomato, basil and a drizzle of the homemade balsamic reduction.That is exciting! I am so happy for you! Regardless, the recipe was awesome! Thanks so much!